Palo Alto police have released a sketch of a suspected intruder who startled a woman early Sunday morning when he entered her bedroom, turned off the lights and sat next to her. 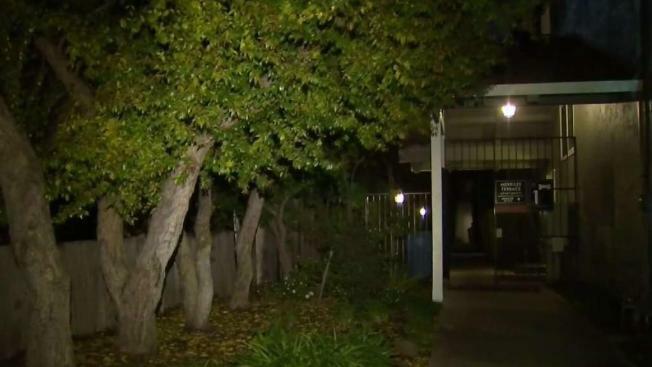 The incident occurred about 3:45 a.m. at an apartment in the 3900 block of El Camino Real, police said. The suspect exited the apartment soon after he arrived. Police believe he got in through an unlocked front door. One of two women living in the apartment was studying in her bedroom when the unknown man wearing gloves and holding a flashlight entered the room, police said. The suspect turned off the lights, sat next to her on the bed and started talking to her. The victim left the bedroom and went to find her roommate, and the suspect then left the apartment. The suspect didn't touch the victim, didn't make any threats and didn't steal anything, police said. He was described as a Hispanic male in his mid-30s, 5 feet, 8 inches tall, weighing 180 pounds. He wore a dark hooded sweatshirt and black pants. "At this point, we don’t know what his intent was," Palo Alto police spokeswoman Janine De La Vega said Wednesday. Anyone with information about this incident is asked to call our 24-hour dispatch center at 650-329-2413. Anonymous tips can be e-mailed to paloalto@tipnow.org or sent via text message or voicemail to 650-383-8984.